In what proved to be one of the most exciting, closely-fought qualifying sessions of the 2014 season of Formula 1 racing, Lewis Hamilton beat his Mercedes-AMG Hybrid driving teammate, Nico Rosberg, to pole position by just seven one-thousandths of a second (0.007). Despite Mercedes’ front row lockout, however, the Silver Arrows duo look especially vulnerable ahead of tomorrow’s Singapore GP. What am I talking about? Read on. Ferrari’s Fernando Alonso and Kimi Raikkonen both put in trilling drives in Friday’s free practice sessions, but they downplayed the results as typical. “As always, Friday in Singapore is a bit different to what it is at other tracks,” said double-World Drivers’ Champion Alonso, explaining that Friday’s pace doesn’t always translate to pace when it counts. After putting their cars on the third and fourth row, respectively, the Ferrari duo were uncharacteristically upbeat (for 2014, anyway). Especially upbeat, in fact, following Raikkonen’s last lap failure in Q3. Ahead of the Ferraris, the Red Bull Renaults of both Daniel Ricciardo and Sebastian Vettel seemed very quick, as well. Ricciardo had a convincing grip on P1 going into the final seconds of Q3, and is as close to the Mercedes as any Red Bull driver has been in 2014. His teammate, 4-time WDC Sebastian Vettel, was very nearly there, as well- proving, perhaps, that Singapore is a race between chassis and drivers more than it is about engines and straight-line speed. There were very few other surprises further back in the field- except, perhaps, the fact that rookie McLaren Mercedes driver Kevin Magnussen out-qualified his more experienced teammate (again), which is making a tough season for Jenson Button look quite a bit like it may be his last. More on that later, though. For now, check out how the rest of the F1 field will line up for tomorrow morning’s Singapore GP, below, and catch the race live tomorrow morning on NBCSports. 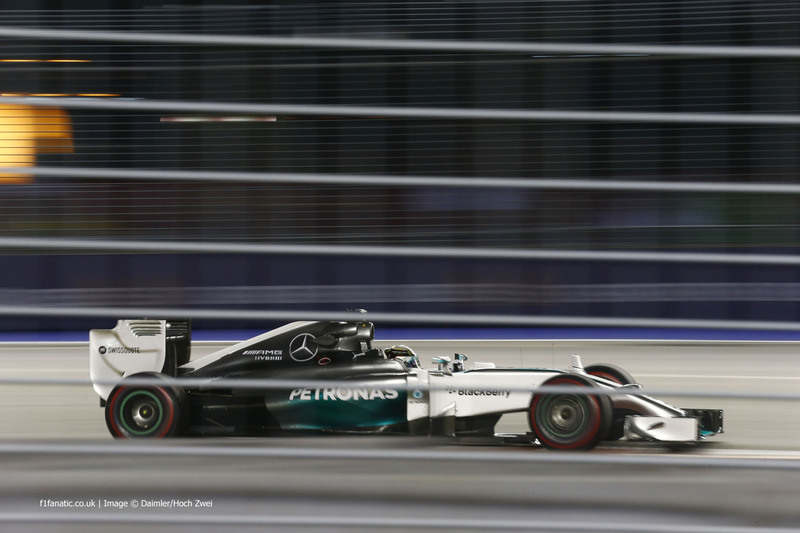 Sources | Photos: Formula 1, F1Fanatic.